Well, I just beat Pokémon Black's seventh gym leader, Brycen. Does anyone else think he may be a "friend of Dorothy" (i.e., gay), by the way? I think it's a distinct possibility. 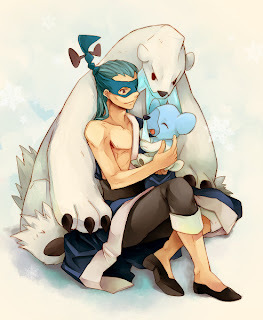 Anyway, much like I did with his predecessor, Skyla, I beat the oh-so-gayly-named Icirrus City gym leader on my first try. Granted, Brycen and his ice-type Pokémon (below) didn't put up much of a fight, but I'll take what I can get at this point. Next up on my journey through the game's Unova region: Dragonspiral Tower. I'm going to encounter a Pokémon every other step in there, aren't I? Oh, well, onwards and upwards, as they say. You know, he could be gay. All the more power to him, if he is! He's WAY gay. WAAAAY! And...also, I thought Dragonspiral Tower was actually pretty simple. You'll encounter a TRAINER ever step...but wild pokemon? They're not so bad there, as far as I remember. Hmmm, are you saying that seriously or facetiously?